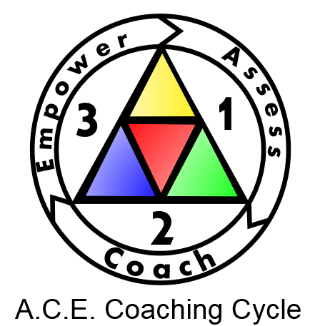 ACE Process – A three point approach to coaching that focuses on assessment, coaching in depth, and empowerment. The ACE process works in concert with the whole person model. Active Imagination – A method that C.G. Jung devised to assimilate unconscious contents (i.e., fantasy images) through means of a constructive expression in everyday life. For additional information regarding active imagination, click here. Amplification – A constructive method based on the comparative study and analysis of mythology, religion, and fairy tales. Amplification seeks out symbolic parallels to establish meaning in an archetypal context. Anima/Animus – The anima represents a man’s unconscious image of woman and the animus represents a woman’s unconscious image of man. As contrasexual soul images, anima and animus mediate the ego’s relationship with the personal unconscious. The anima/animus archetype demarcates passage to the deep interior of the unconscious in dreams, fantasies, and fairytales. The anima/animus is the counterpart of the persona. In Beebe’s Whole Type Model (see below), the inferior function of the personality is usually personified by an anima or animus figure which usually appears as the opposite gender of the individual. For additional information regarding anima and animus, click here. Archetype – Though there is no set definition for an archetype, one could call it an a priori psychic response mechanism that is often personified in dreams, fantasies, and projections as images. As genes are the basic unit of the genome, the archetype could be understood as the fundamental unit of the collective unconscious and an analogue of the instincts. For more information regarding archetypes, click here. Association – A method used for connecting ideas, perceptions, and images according to contiguity, opposition, and similarity. Association is often used in the analysis of dreams. Auxiliary Function – The second most employed function of the personality. It directly supports the superior function and thus is opposite of the superior function’s type and attitude. Beebe’s Eight-Process Archetypal Model (Whole Type Model) – Dr. John Beebe’s “extension and addition” (Beebe, 2004, p. 110) to C.G. Jung’s original type model, which takes into account the efficacy of all eight function combinations and attributes them with archetypal qualities. Dr. Beebe’s model includes both the ego-syntonic complexes of the basic orientation and the ego-dystonic complexes contained in the shadow personality. The archetypal complexes depicted in the described model often appear in dreams, movies, and literature. See figure below. For additional information, click here. Collective Unconscious – An empirical concept proposed by Jung referring to the archaic deposits in the psyche common and inherent to all humankind. According to Jung, consciousness is like an island that owes its existence to an extensive substratum beneath the ocean’s surface, which would be analogous to the collective unconscious. For more information regarding the concept of the collective unconscious, click here. Complex – Complexes represent parts of the personal psyche that become splintered or separated from the ego as a result of trauma or other personal and collective factors. From the standpoint of ego-consciousness, the complex seems autonomous as though it has a mind of its own. Complexes can disturb the ego and create personal and cognitive problems. These disturbances can hinder personal growth and development. Whereas the archetype could be viewed as the basic unit of the collective unconscious, complexes comprise the basic structure of an individual’s personal unconscious. For information regarding the complex, click here. Confirmation Bias – The tendency to search for, interpret, or recall information in a way that confirms one’s pre-existing beliefs or hypotheses. Demon/Daimon – In Dr. Beebe’s Whole Type Model, the demon/daimon, as the name suggests, is often the most problematic of all the archetypal processes within the shadow since it resides in the deepest layers of the personal unconscious. It can appear as a person, animal, or object. As it is unconscious, it often leads to distorted projections. It can behave like a clumsy oaf or an annoying imp that disturbs one’s intentions. On the positive side, it can serve as a redemptive spirit (i.e., daimon) that inspires and invigorates. The demonic function tends to test the integrity of the inferior function (i.e., anima/animus). Depth Coaching – A client-centered profession that uses the ACE process and the whole person model in order to help clients enhance their quality of life, overcome obstacles, and cultivate a deeper sense of meaning and self-awareness. Depth Enabler – A tool employed during depth coaching to assist clients better align their life with their goals and aspirations. An enabler can be something as simple as 360° feedback or as formalized as the administration of a psychological instrument like the Myers-Briggs® Type Indicator. Depth Profile™ – A comprehensive tool used to assess and model the personality that we provide for any client interested in long-term personal and professional development. The depth profile is derived from pattern analysis and information inferred from the abovementioned depth enablers. To see a sample depth profile™, click here. Ego – The central complex of identity which constitutes the center of consciousness. It is important to note that though the ego is the central complex, it is merely one of many. For more information regarding the ego, click here. Eros – A maternal principle referring to the personality’s capacity to relate. Eros exhibits a connective quality. Opposite of Logos. Extraversion – A psychological mode or attitude characterized by the tendency of psychic energy to move outward (i.e., centrifugal) toward the external world of objects and things. Feeling – The subjective process of valuation. Contrary to popular opinion, the feeling function does not refer purely to emotion or affect but is rational in the sense that it evaluates in a qualitative way—as opposed to a quantitative way (e.g., thinking). Feeling tells a person what something is worth thereby implying a value judgment. Hero/Heroine – The central protagonist in a story which has multiple actors and cast. The ego as such is often imbued with certain heroic qualities thus it is not surprising that it is sometimes called the heroic ego. In Dr. Beebe’s Whole Type model, the hero/heroine complex refers to the superior function. 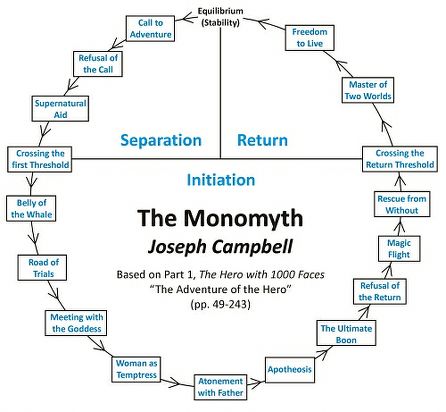 Hero’s/Heroine’s Journey – A model also known as the monomyth put forward by the mythologist Joseph Campbell. It suggests three major themes: departure (or separation), initiation, and return. 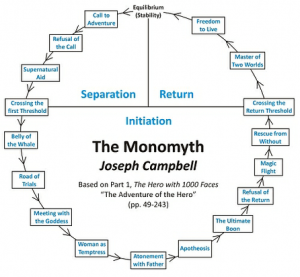 Many myths and works of literature contain a similar motif. The model could be used as a metaphor for personal spiritual and psychological growth. For more information, click here. Individuation – The process by which a person becomes a whole individual through continuous differentiation. Individuation is the personality’s natural tendency of reconciling its inner opposites and realizing the greater totality of the psyche (both conscious and unconscious). For more information regarding individuation, click here. Inferior Function – The least differentiated or operative of the four ego-centric psychological functions. 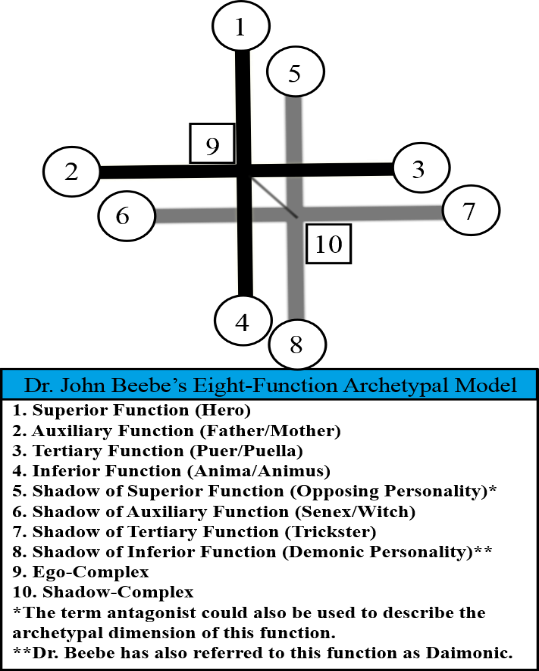 In Dr. Beebe’s eight function model, the inferior function is represented by the anima-animus and thus borders the shadow. “The inferior function is the door through which all the figures of the unconscious come into consciousness. Our conscious realm is like a room with four doors, and it is the fourth door by which the Shadow, the Animus or the Anima, and the personification of the Self comes in” (Von Franz & Hillman, 1971, pp. 55-56). Introversion – A psychological mode or attitude characterized by the tendency of psychic energy to move inward (i.e., centripetal) toward the subjective inner world of thoughts and ideas. Intuition – In Jung’s typology, intuition is considered one of the four functions of consciousness, which constitutes a kind of unconscious perception. According to Jung, “intuition points to possibilities as to whence it came and whither it is going in a given situation” (1921/1971, CW6, para. 958). Libido – Viewed in the Jungian sense, the term more generally refers to psychic energy. For additional information regarding libido, click here. Life-line – The concept of a life-line is only mentioned a mere seven times in Jung’s collected works and thus its importance as a psychological idea seems overlooked. Given Jung’s commentary on the idea of life-lines (1916, CW7, para. 500-516), one could say they trace the currents of the personality’s libido at any given moment and thus show a snapshot of the individuation process in time. Viewed another way, the life-line seems to demarcate where in life individual and collective tendencies collide. A life-line could be viewed as an analogue of the world-line concept in physics. For additional information, click here. Logos – A paternal principle referring to the personality’s capacity to discriminate the opposites, judge and rationalize. Opposite of Eros. Mandala – In Sanskrit, the term means “magic circle”. Jung thought that mandalas were universally meaningful as evidenced by their ubiquitous presence in art, religion, and other areas of culture. Mandalas are self-contained circles or squares that are often divided by the number four and its multiples, which suggests a symbol of wholeness. MBTI® – A psychometric instrument designed to measure how people tend to perceive the world and make decisions. These preferences were extrapolated by Katharine Briggs and Isabel Briggs Myers from the typological theories originated by Carl Gustav Jung and first published in his 1921 book Psychological Types. Jung theorized that there are four primary psychological functions by which we experience the world: sensation, intuition, feeling, and thinking. One of these four functions is dominant most of the time. Jung also posited two basic psychological attitudes—introversion and extraversion. The MBTI® instrument sorts the four functions and two attitudes into dichotomous pairs and combinations resulting in a total of 16 possible psychological types indicated by a four letter code (i.e., INTJ, ENTP, etc.). To see the MBTI® Form M Profile, click here. Mental Model – An idea originally introduced by the American Philosopher C.S. Peirce, a mental model is a psychological representation of a real, hypothetical, or an imaginary situation. Viewed through the lens of Jungian psychology, it could also be viewed as an archetypal image. For additional information, click here. Mother/Father – In Dr. Beebe’s Whole Type Model, the mother/father configuration epitomizes the auxiliary function of the type model. This functional complex, as the names suggest, reflects the archetype of the parents (mother or father) and establishes basic standards of care and social discourse. This archetype has a nurturing and supportive role. Myth – A collective statement or motif that is based on the collective experience of humankind and passed on symbolically through stories, fantasies, and dreams. Opposing Personality – In Dr. Beebe’s Whole Type model, the opposing personality acts as the primary antagonist to the superior function (i.e., hero/heroine) and often has a schizoid quality which is adverse to the aims of the superior function. The opposing personality usually appears as an adversary in dreams, fantasies, and movies. Paradigm – Taken literally from its Greek (i.e., paradeigma) etymological root, the word means a pattern or model however more generally refers to a contemporary world-view. The dominant conceptual framework that shapes and models collective thinking. Persona – Taken literally, the word means the mask worn by an actor. Viewed psychologically, the term refers to the personality’s mode of adaptation to the world, its objects, and the general social milieu. After all, we all wear a mask when the situation calls for it. How I act around my children, for instance, is vastly different from how I act and conduct myself at work. Ultimately, the persona is how the individual is seen by the external world. Counterpart of anima/animus. For more information about the persona, click here. Personal Equation – The idea that one sees the world the way he/she is rather than the way it actually is. The personal equation underscores our biases and prejudices. One’s personal equation basically distorts his/her views and suggests that no experience is purely an objective experience. Confirmation bias is strongly rooted in one’s personal equation. PMAI® – An empirically tested archetype assessment tool, which reveals to the client patterns depicted by the current unconscious narrative that typifies his/her life. The PMAI® suggests a model that can help a client develop a better understanding of the archetypal patterns that dominate their life. The PMAI® could be viewed as an instrument that measures a person’s narrative intelligence and thus reveal the story they are currently living. The instrument deals in 12 distinct archetypes. To see the Pearson-Marr Archetype Indicator®, click here. Progression – A forward movement of psychic energy (i.e., libido) for the purpose of adaptation. Projection – A process by which one perceives his/her own unconscious and subjective contents to be attributes of other people. We automatically assume that other people are as we imagine them to be and this is rarely the case. For additional information regarding projections, click here. Psyche – The totality of psychic processes, both conscious and unconscious. Viewed more narrowly, one could say that the psyche is the image-making faculty of the personality. For more information regarding the psyche, click here. Puer/Puella – In Dr. Beebe’s Whole Type model, the puer/puella epitomizes the archetype of the eternal child (e.g., Peter Pan) and corresponds to the tertiary function of ego-complex. The puer/puella represents the part of the personality that wishes to remain in the carefree paradise of childhood. It often feels compelled to improvise. Regression – A backward/retrogressive movement of psychic energy (i.e., libido) to an earlier point of adaptation. Self – The archetype of psychic wholeness, the center of the total personality. For additional information regarding the self, click here. Senex/Witch – In Dr. Beebe’s Whole Type model, the senex or witch, as their names suggest, sets limitations on the personality through enforcing structure or imposing some obstacle. Though this archetypal complex can offer sage wisdom, it is often difficult to understand. This archetype has a certain authoritarian psychological coloring. Sensation – An irrational (i.e., perceiving) function that primarily mediates physical perceptions and stimuli (i.e., sense perceptions). Like the other three functions, it can express itself both in an introverted and extraverted way. Shadow – Unconscious aspects of oneself that the conscious personality opts to hide and repress. For additional information regarding the shadow, click here. Sign – A symbol that is no longer moored to the unconscious and thus has only a single conventional meaning. Once a symbol becomes a sign, it has effectively died. A sign is merely a designation for something completely known. For additional information regarding a sign, click here. SL-TDI™ – The Singer Loomis Type Deployment Inventory (SL-TDI™) is a user friendly typological instrument that provides another perspective on the typological concepts originally formulated by Carl Jung. June Singer and Mary Loomis (Both Jungian Analysts) removed the dichotomous assumption of Jung’s typology and designed a psychological Likert scale. In the Singer and Loomis model, a person may have more than one dominant function. The SL-TDI™ eliminates the old forced-choice structure and uses a psychological scale. Moving Boundaries, Inc. owns the license for the SL-TDI™. To see the Singer-Loomis™ Report, click here. Symbol – The best possible expression for something mostly unconscious or unknown. For additional information regarding the symbol, click here. Synchronicity – A working hypothesis that Jung developed which suggests that there is an acausal connection between the inner world of the psyche and outer world of physical processes which coincide in time. Jung referred instances of synchronicities as meaningful coincidences. For additional information regarding synchronicity, click here. Thinking – A rational (judging) function that evaluates based on conceptual reasoning and analysis rather than subjective valuation (i.e., feeling). Thinking then refers to the cognitive faculty that tells one what something objectively means. Thinking Trap – A rigid pattern in one’s thinking that can cause him/her to fail to identify critical information about a person, group, or situation. For additional information, click here. Transference/Countertransference – A certain kind of relational projection wherein one’s subjective contents are artificially transferred to other people and/or situations. Triangulation – The reliance on two or more theoretical frames or models to more accurately assess a person’s consistent personality type. Triangulation serves to avoid generalizations and typecasting by relying on more than one set of data points. Trickster – As its name implies, it has the tendency to behave mischievously and impart lessons through paradox. Hermes is viewed as a trickster figure in Greek mythology. The trickster’s actions can often lead to a flash of insight. 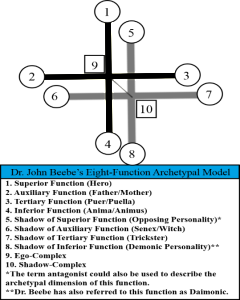 The trickster is also one of the archetypal complexes in Dr. Beebe’s Whole Type Model. Typology – A systematic way of sorting distinct attitudes and types of consciousness to help understand the variations that occur among individuals and provide clues about innate psychological differences. “It is not the purpose of a psychological typology to classify human beings into categories— this in itself would be pretty pointless. Its purpose is rather to provide a critical psychology which will make a methodical investigation and presentation of the empirical material possible” (Jung, 1921/1971, CW6, para. 986). See figure below. 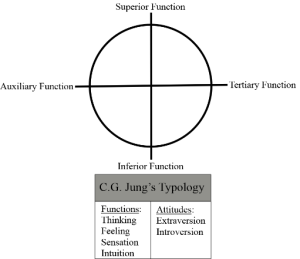 For more information regarding Jung’s typology, click here. Unconscious – The part of the psyche that is not readily accessible or associated with the field of consciousness. Jung often distinguished between the collective and personal unconscious. The former could be viewed as collective repository of all human experiences whereas the former represents the individual’s unconscious, which is nested within the collective unconscious. For more information regarding the concept of the unconscious, click here. 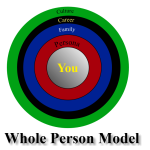 Whole person model – A holistic approach to the personality that takes into account both unconscious and conscious processes and past patterns and future possibilities. Beebe, J. (2004). Theory of psychological types. In Murray Stein (Ed. ), Analytical psychology: Contemporary perspectives in Jungian analysis, pp. 83-105. New York, NY: Brunner-Routledge. Jung, C.G. (1916).The structure of the unconscious. In H. Read, M. Fordham, G. Adler & W. McGuire (Eds. ), The collected works of C.G. Jung (R. F. C. Hull, Trans.) (2nd ed., Vol. 7, pp. 154-160). Princeton, NJ: Princeton University Press. (Eds. ), The collected works of C.G. Jung (R. F. C. Hull, Trans.) (2nd ed., Vol. 6). Princeton, NJ: Princeton University Press. Von Franz, M.L. and Hillman J. (1971). Lectures on Jung’s Typology. Zurich: Spring Publications.